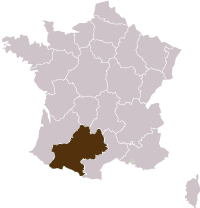 The section between Lectoure and Saint Jean Pied de Port winds its way first through the Quercy and the Armagnac region and then through 2 areas: the Bearn and the Basque Country. The walk first crosses the green wooded hilly landscape between Aire and Navarrenx and then climbs up through the white villages to Saint Jean Pied de Port.The Pyrenees range in the background,each day closer while approaching Ostabat the meeting point of 3 of the Way of St James Routes.The Sauvelade Abbey,the Navarrenx Bastide, Saint Palais are famous remarkable places. Today you will pass by Marsolan and a St James Hospital. From the terrace the view overlooks the green valley. Les Landes and its great fields of corn, and as a backdrop the Pyrenees range can be seen in the distance-Dinner and night in a 3*** Guest House. This easy stage will take you to one of the oldest “bastide”, Pimbo, and to Arzacq a beautiful village. Dinner and night in a 3*** Guest House. This stage crosses Bearn with a few beautiful churches, Ste Quitterie or Saint Jacques in Pomps The stage is less flat with a small elevation gain. Dinner and night in a hotel in Arthez. The 13th century abbey with its Greek cross shape is worth the visit. Dinner and night. This hilly stage is more challenging than the previous day but does not exceed 150 meters of elevation gain. Fortified Navarrenx will welcome you for the tasty dinner and night in a 2* hotel. Last stage before the Spanish border. Walk through small hamlets and across the Oyhanzarre Pass (365 m) and reach your final stage, the fortified mountain city of Saint Jean Pied de Port, departure point for the French Camino. Night in a 3* hotel. Dinner on your own. 2 and 3 star hotels and Guest Houses. Private bathrooms. Half board from dinner day 1 to breakfast on the last day. (Dinners and breakfasts). One road book for 2 persons with the description of your program and full detailed walks with a 1/100000 walking map. All lunches (picnic can be oredered in advance in your hotel or you can buy them in groceries on the way). EASY WAY BACK TO CAHORS WITH THE SHUTTLE.